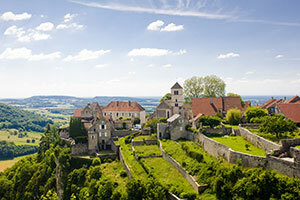 If you've not yet tried one of our camping holidays in Jura, you've a real treat in store. Unspoilt woodland, lakes and cascading waterfalls make camping in Jura a superb choice for families, and anyone who enjoys getting close to nature. But it’s not all sitting around admiring the spectacular views from the old forts that still guard the valleys, or relaxing in a stylish thermal spa. The magical forests and majestic mountains of Jura provide an amazing setting for a really active holiday - with mountain biking, walking and hiking, and of course, superb water sports. So if you’re looking to try somewhere different in France for your camping holidays, in Jura you’ll find just what you’re looking for. Fort de Joux With its commanding views and breathtaking cliff top position the Château de Joux has been a castle, a grim state prison and a military fortification. Take a guided tour of the castle and browse the rare weapons in the museum of armaments. Cascades du Hérisson This spectacular natural feature is a series of thundering waterfalls and torrents, dropping more than 800 metres through a rocky valley. The Maison des Cascades Visitor Centre explains the history and legends of the Hérisson valley. Baume-les-Messieurs Set at the meeting point of three valleys, the pretty village of Baume-les-Messieurs is home to a famous Benedictine Abbey, which in turn houses a spectacular 16th century altar piece. Take a guided tour of Les Grottes de Baume, an amazing system of caves and underground lakes carved out by the River Dard. Besançon Besançon is dominated by the sprawling Citadel that overlooks the town and the river. Enjoy the view from the ramparts and allow plenty of time to explore the Museum of French Resistance and Deportation, the natural history museum and zoo, and the Musée Comtois, depicting local life and history. Lons-le-Saunier The pretty town of Lons-le-Saunier is proud of its Roman heritage and its thermal spa. There are several museums, including one dedicated to its famous son, Rouget de Lisle, the composer of the ‘Marseillaise’. Clairvaux-les-Lacs This small market town is the main resort of the Jura lakes region. The scenic Grand Lac with its lovely beach is the focus for many water sports. There’s also an aerial adventure park set in a pine forest. Salins-les-Bains and the Royal Salt works of Arc-et-SenansYou can still enjoy a thermal bath at Salins-les-Bains, but salt production stopped in the 1960s. At the Grande Saline you can tour the impressive underground salt works and visit the Musée de Sel. A 13 mile duct took brine from here to the massive Royal Salt Works at Arc-et-Senans, part of an ideal factory-city commissioned by Louis XV and never completed. Both locations are now UNESCO World Heritage Sites. To find your perfect campsite in the Jura please use our interactive site finder, call our knowledgeable customer advice team on 01 242 1901, or go straight to the individual campsite pages.